This topic is one that is near and dear to me, since I spent the bulk of my graduate school career studying and writing about this for my thesis. 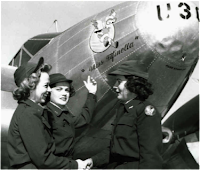 This post is designed to give you little bits of information on what Disney was doing during WWII. 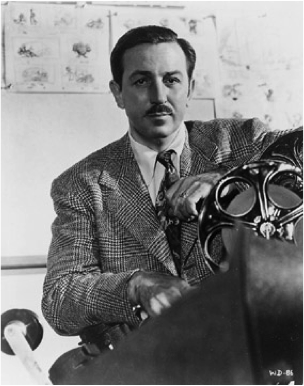 Walt Disney had several different responsibilities over the course of the war. 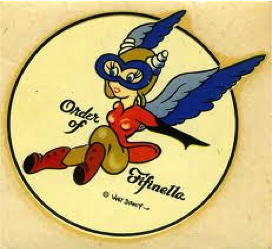 One that we are probably most familiar was the use of Fifinella, a female gremlin, as the official mascot of the WASP (Women Airforce Service Pilots). Disney had developed this character for Richard Dahl for use in his work The Gremlins. Members of WASP asked if this image could be used as their mascot and Disney agreed, changing the design slightly to better be suited for WASP needs. In 1939, Disney had begun construction on his Burbank studios. Completed in 1940, the original soundstage (known today as the Fantasia Stage) was repurposed during the war as an area where army vehicle were repaired. Finally, we come to what I think is one of the most interesting aspects of the Walt Disney Company during the war – the development of propaganda and informational films. Like other Hollywood producers at the time, Disney believed that film should have an integral role in molding the public opinion of the war efforts. Unlike the other producers, Disney moved from the battlefields and worked to create an animated short that was more tangible to the public viewing the film. Mickey Mouse and Donald Duck had been well established personalities by 1941 and the public was able to connect with their character. It was Donald, not Mickey who was the star of the Disney Studio in 1930s and 1940s. 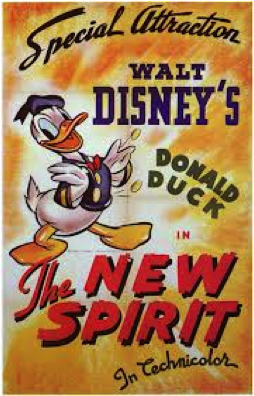 The first film produced by Disney in the US in WWII was The New Spirit. Secretary of Treasury Henry Morgenthau, Jr. meet with Walt Disney on December 17, 1941 to discuss the production of a short animation that would explain to the audience the importance of paying taxes on time. Donald was chosen to be the protagonist because Disney had just a few short weeks to create this film – a process which generally took eight months to a year! Released in January 1942, this animated short would have been seen by millions of people in over 12,000 studios by the March 15th tax deadline. Donald would go on to star in twelve additional films produced for the war effort. Other films produced included instructional films used by the military to teach specialized training, and in military factories to instruct workers on skills such as the methods of flush riveting (View here: http://www.youtube.com/watch?v=dyXEjn7f330). Additionally, Disney released four “psychological” animations, such as the 1943 film Education for Death, which became one of the most popular Disney films produced during this time period. Based on the book by Gregor Ziemer, this film took more of a psychological look at the development of a young German into a Nazi party member. The Disney Company participated in the war effort in a variety of ways, but one thing is certain, Walt Disney made sure everything he produced was educational, informative, entertaining, and promoted national unity in victory over the Axis powers. All of the Disney Company’s WWII productions can be found on YouTube or as part of the War Disney Treasures DVD collection. – Learning from Mickey, Donald, and Walt: Essays on Disney’s Edutainment Films, A. Bowdoin Van Riper. Jefferson, NC: McFarland & Company, Inc. 2011. – Shale, Richard. Donald Duck Joins Up: The Walt Disney Studio During World War II. Ann Arbor: UMI Research Press, 1982.